Prior to this operation, on September 10/11, 1944, 205 Group lost two aircraft. One was lost on a mining operation over the Danube, the other while on a supply dropping mission over Warsaw. There were no survivors. Despite repeated attacks on the Marshalling yards at Bologna, they remained serviceable and was still an important rail junction supplying the front lines of battle. On September 12/13, 1944, ninety aircraft of 205 Group were sent to attack this target once more. Eight Wellingtons of 37 Squadron participated in the raid. This operation marked the return to duty of Wellington Mk.X LN798 "D" - MacIsaac and crew took off from Tortorella in their newly repaired aircraft at 1904 hours with a payload of nine 500 and five 250 pound bombs. ETA over the yards was about two and one half hours. Opposition consisted of moderate, accurate heavy caliber flak from Bologna and slight heavy caliber flak from Ravenna. All eight 37 Squadron aircraft attacked the target, dropping one 4000 pound bomb, sixty two 500 pound bombs, thirty four 250 pound bombs and 56 packets of leaflets from 2122 to 2124 hours at altitudes of 9000 to 9800 feet. Bombing was well concentrated on the red target indicators and two 4000 pound bombs dropped by 205 Group were seen to fall in the marshalling yard. One large fire was reported burning in the yards as the Squadron departed for home. F/Sgt. MacIsaacs aiming point photo over Bologna. 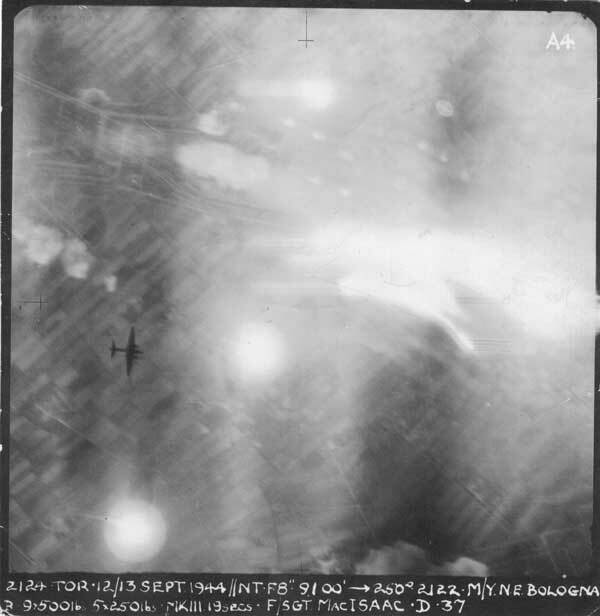 Two TI’s, bomb bursts, AA emplacements, searchlights, and even a stray Wellington (dangerously near the path of MacIsaacs falling bombs) are visible. MacIsaac bombed on the red TI’s at 2122 hours from 9100 feet on a heading of 250 degrees. No results were observed, however, photographs over the target showed his bombs were well concentrated and on target. 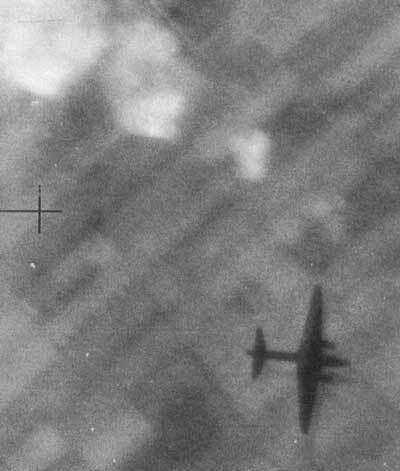 Detail from MacIsaacs aiming point photo of 12/13 September, 1944 showing bomb bursts and a single unidentified Wellington well below its correct altitude. The aircraft is from one of the other 205 Group Squadrons and may very well be one of those lost on this mission. Seven photos were plotted, five north, one south and one in the center of the Marshalling yards. 37 Squadron suffered no losses, however, two 205 Group Wellingtons, along with their crews, were lost on this operation. Flight Sergeant MacIsaac landed safely at Tortorella at 2338 hours. CHANGE OF COMMAND - Following his arrival the previous day, WING COMMANDER H.A. LANGTON, D.F.C., assumed command of No. 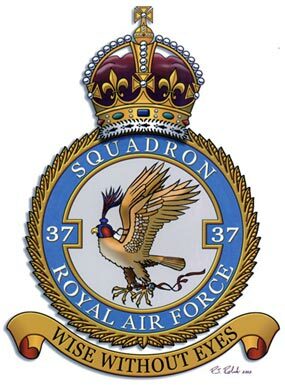 37 SQUADRON from SQUADRON LEADER P.W. FORSYTH, D.F.C., who relinquished temporary command on this day. PARADE - A Squadron parade was held as a dress rehearsal for the Battle of Britain Commemoration Parade. Having regard to the lack of a suitable parade ground and the fact that a large number of the men had not done foot drill for upwards of two years, the turn out was remarkably smart and the marching commendable.